Holiday Fun Time – Host a Cookie Exchange. From now through the end of the year, there are so many holidays, and such fun to be enjoyed with friends and family. One of my favorite traditions is to host a cookie exchange. A cookie exchange is not just for Christmas either. Halloween, Thanksgiving, Valentine’s day and Easter are also popular times for cookie exchanges. 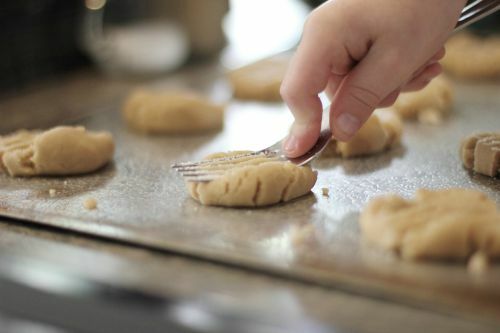 These cooking tips and other tips will make sure your cookie swap is a great one. What is a cookie exchange? Simply put, it’s a party where your friends or family all come with a box of their favorite cookies. 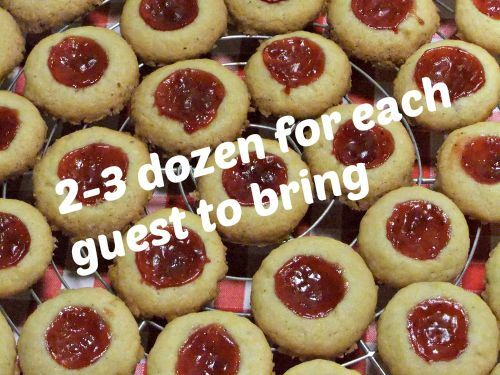 Everyone swaps them around and the guests end up going home with a box of mixed cookies, instead of the single cookie that they brought to the party. One of the best things about a cookie exchange, particularly during the busy holiday season, is that it shortcuts your own cooking tasks. You can bake a few dozen of one variety but end up with several in your home after the party. This gives you the variety of cookies you want in your home without the task of having to make them all yourself. Win-win in my book. Plus a cookie exchange is a lot of fun too. 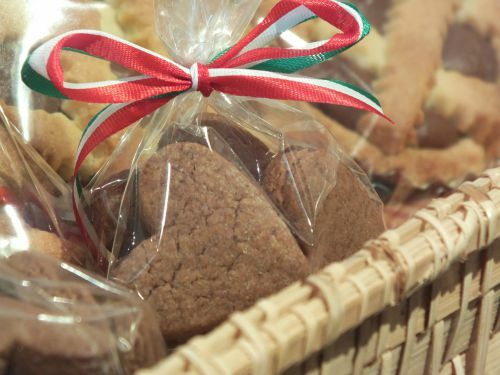 Here are some simple tips to make your holiday cookie exchange one that will be a big success. 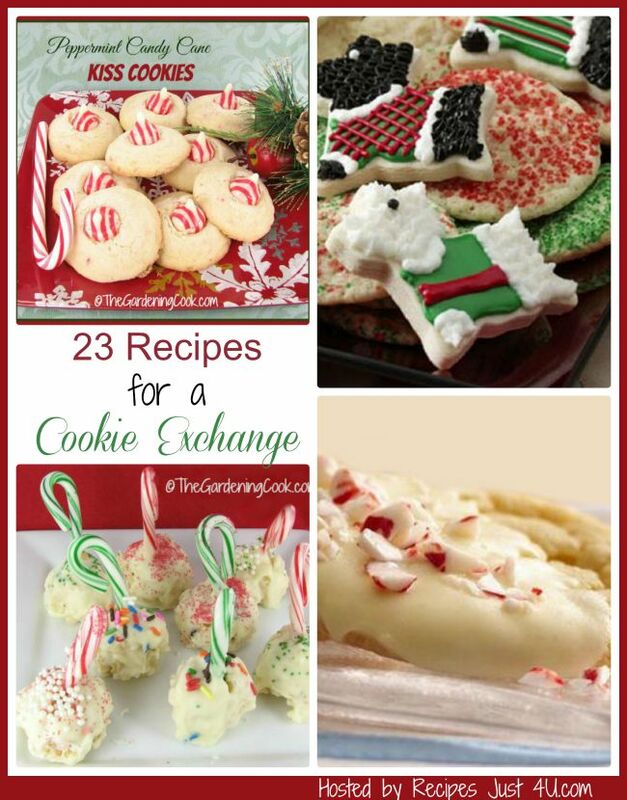 Be sure to check the bottom of the article for some great cookie recipes great cookie recipes too. 1. Invites are a must. Send out invitationsearly. Give people about 4 weeks to prepare. You don’t want to send last minute invites where the only option is to go to the local grocery store and pick up a box of store bought cookies. What you are wanting is a nice variety of homemade cookies and these take time to prepare, especially around the holiday time when there is so much to do. 2. What are the rules? Be clear in the invite what you expect each guest to bring. A good rule of thumb for a party of about a dozen is 3 dozen cookies. 1-2 dozen to share at the end of the party and one dozen to sample during the party. 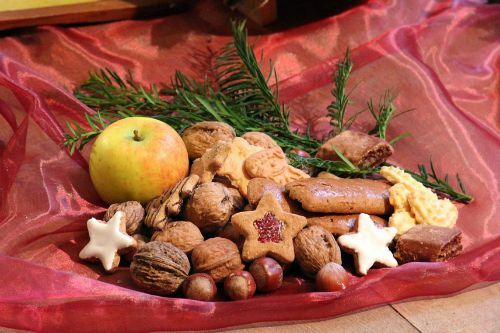 Of course, no guest will eat all 12 cookies, but it will give variety for the most popular ones and will allow each guest to return home with close to 2 dozen cookies that are assorted. Of particular importance is whether people bake from scratch (yes please!). Otherwise someone who slaves over homemade cookies will take home slice and bake and will not be very happy with this. 3. Set limits on who is invited. You can do this anyway you would like, but I like to limit it to girl friends or mums. If you allow people to bring husbands or children, guess what will happen to the cookies during the party? My guess is that their probably won’t be many to bring home! This is a cookie exchange, not a cookie tasting. Since it’s so busy this time of the year, invite more people than you think will attend. It is not uncommon for those (even if they have sent an RSVP!) to not show up. A successful cookie exchange has a lot of types of cookies and that means plenty of guests. 4. To Label the cookies or not? This depends on how crafty you are. I think that it is helpful to label the cookies as you put them on the table, particularly if you have a lot of guests. 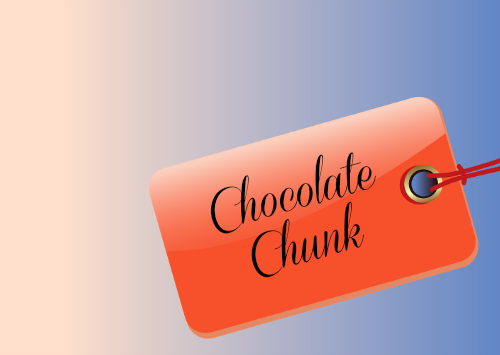 This will allow guests to know just what the cookies are made of. If you only have a few guests, you can do this verbally during the party instead. 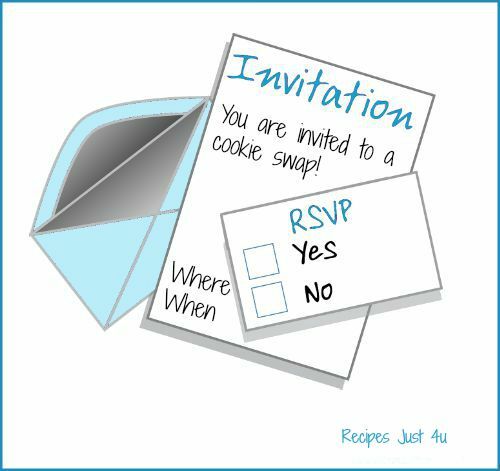 One idea that I like is to have each party goer print their recipe out on a card and place it next to the cookie. This labels the cookie and allows people to copy it if they would like to make it themselves. 5. When to bake? 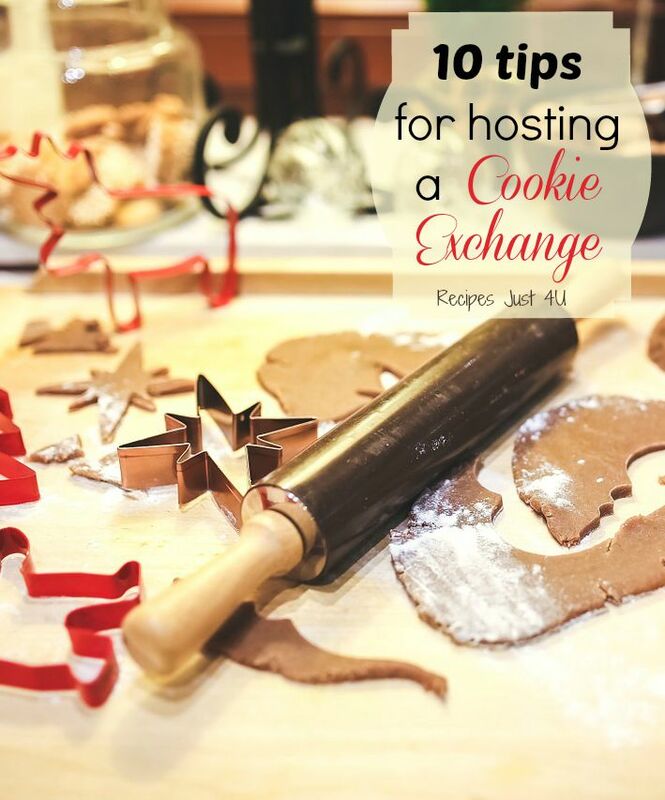 Ask guests to bake their cookies 2-3 days before the cookie swap. Freshly baked cookies don’t transport very well and you’ll end up with a bunch of broken cookies, if they are “fresh from the oven!” Cookies a few days old will have time to dry out a little and will keep their shapes. 6. Prepare for the party. On cookie swap day, brew some coffee and tea and clear off a few tables for sampling, swapping and also for packaging to take home. If you want to get fancy, have a table with some decorative ribbons and plain white gift boxes or clear cellophane on hand, so people can wrap the cookies before leaving the party if they wish to do so. 7. Prepare your party menu. Most guests won’t want to just load up on sweets during the cookie exchange. 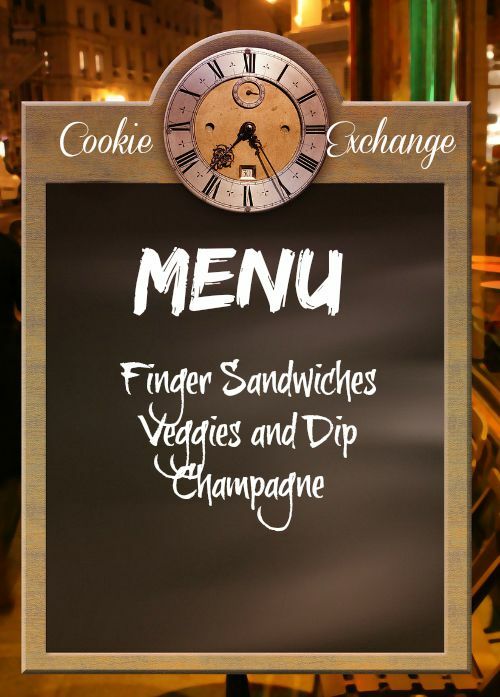 Have a few non sweet choices, such as chips, vegetables or crackers and dip, or small finger sandwiches on hand to eat if they don’t want to sample a lot of cookies. 8. Decorate for the party. You don’t have to go all out for this. Something simple like a festive tablecloth or holiday centerpiece will be plenty. If you are using just one table as a buffet, clear chairs and other furniture away so that people can cruise the cookie table easily. 9. Recipes. Have guests email you their recipes a week ahead of time if possible. That way you can print them out and have them on hand to give to party goers. It also gives you an idea of what will be coming so that you can make labels if you want to. 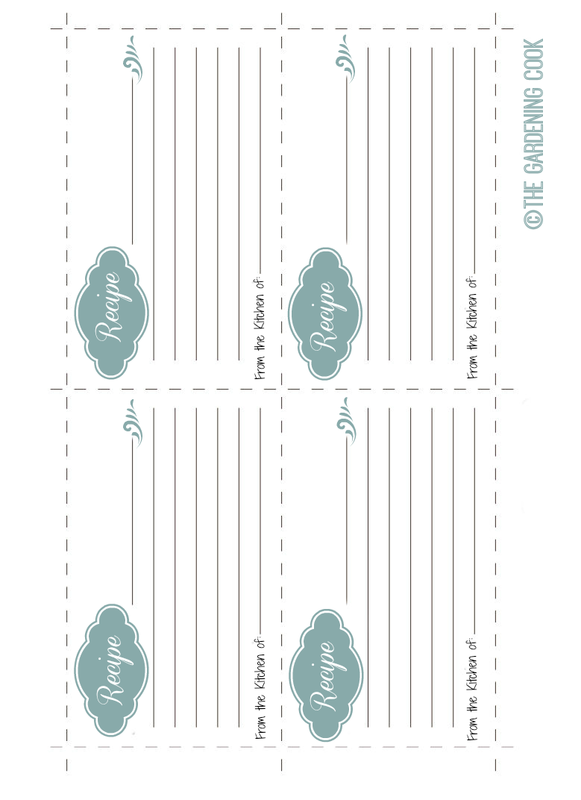 You can even email guests ahead of time with these recipe cards. They can print them out themselves and copy the recipe on the cards. 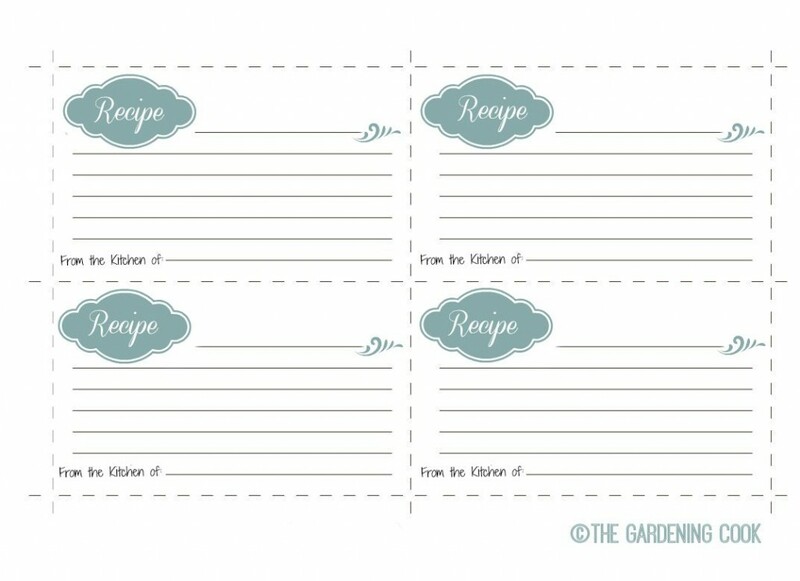 Have them fill out as many recipe cards as the number of guest and then display them next to the cookies at party time. Download the recipe card here and print it out. 10. Serving platters. Be sure you have enough serving platters for the cookies that will be coming. If you don’t, ask friends to bring along a decorative platter to help out. Serving the cookies on pretty platters or plates is much nicer than using paper plates. Don’t worry about them all matching. Mix and Match platters are just fine. 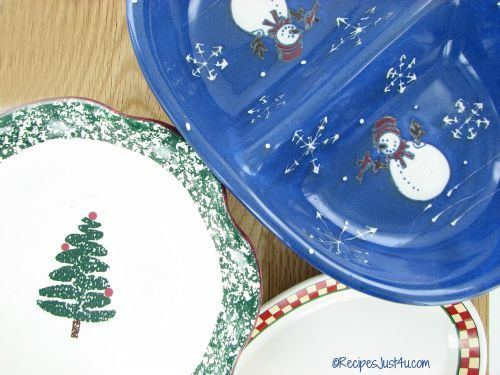 There is no reason to purchase holiday theme serving dishes. Now that you know what to do to host a cookie exchange, here are some ideas for cookies to bake for your party, or another cookie swap that you may be planning on attending. Candy Cane Peppermint Kiss Cookies. Rice Krispie Ball Peppermint Cookies. Sugar Cookies with a Peppermint Crunch Topping. Pestinos – Traditional Spanish holiday cookie. Chocolate Pistachio Nut Bar Cookies. Raw Vegan Chocolate Chip Cookie Dough Balls. Root Beer White Chocolate Chip Pudding Cookies. Berries and Cream Sandwich Cookies. Festive De Leche Chocolate Cookie Bars. Images in this post which are not watermarked are public domain images from Pixabay. For more photo sharing sites, see this article. I went to a cookie exchange at a friends house. It wasn’t a holiday. It’s a good way to meet neighbors and friends. Lot of fun. Glad you enjoyed it Donna. Hope you got some good cookies too! Great tips!!! Planning is the key to a great event like this. It’s worth it for the fun time!